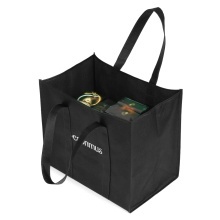 Set of 6 non-woven shopping bags, superior strength makes them perfect for shopping, storage and so on. Up to 40lbs loading capacity and large size, can hold bulky groceries with ease. Multi-purpose: six foldable and portable bags, perfect for shopping, picnic, travel, storage, etc. Large Capacity: 15&apos;&apos;L x 13&apos;&apos;W x 10&apos;&apos;H big size, perfect for holding bulky groceries like milk, laundry detergent, fruits and much more. Good Quality: made of 120GSM non-woven fabrics, tear-resistant, washable, reusable and environmental friendly. Superior Strength: dual reinforced handles, sewn to bottom of the bag for extra durability, provide up to 40lbs loading capacity. Convenient to Use: wide bottom design ensures bags stand upright and stay open when you are packing and unpacking groceries.